Good technology should only compliment your riding experience. With Cardo BOLD, an advanced Natural Voice Operation platform keeps your hands on your bars where they belong. "Hey Cardo, music on", "Hey Cardo, next track", "Hey Cardo, mute audio"; a full suite of menu navigation lies right within easy reach of your vocal fingertips. The revolutionary Scala Rider PackTalk features dual-core wireless technologies for a stable and active communication network. The Bluetooth mode offers legacy by featuring full backward compatibility with other Scala Rider models. The DMC mode will compliment and expand standard Bluetooth connectivity by offering group communication that is far superior to any other existing alternatives. DMC technology constantly forms and re-assembles its virtual network, and assures that communication among large groups remains uninterrupted irrespective of the ever-changing environment. 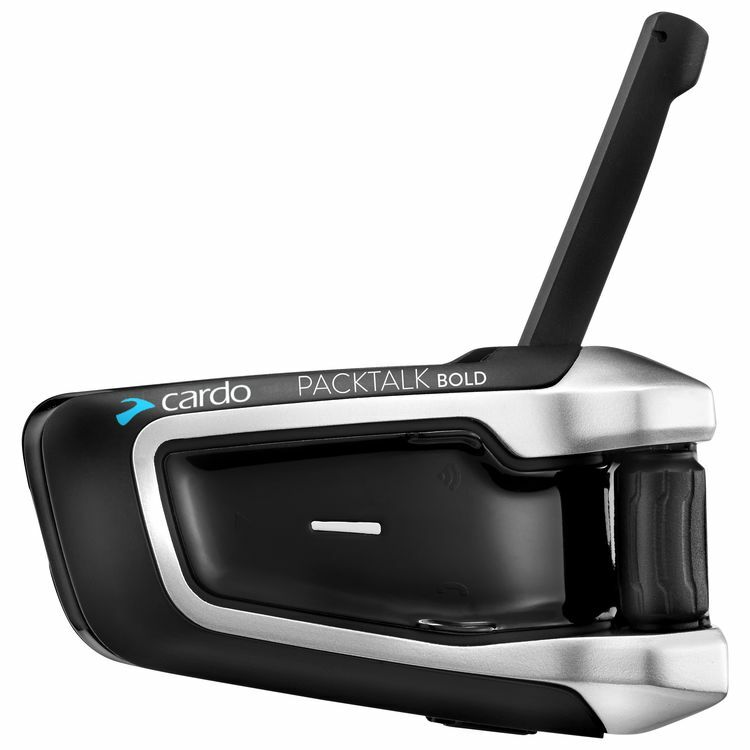 Whenever a Cardo PackTalk user cannot directly connect with group members who are beyond the reach of the intercom, it will re-connect to the next most suitable member in the group in order to ‘leapfrog’ the connection to the remote PackTalk user. This system is virtually seamless and adjusts within split seconds to maintain an active network. When the weather gets tough, the PackTalk keeps going. The PackTalk carries an IP67 waterproof rating. Any rain, sleet, hail or snow will not have an impact on your PackTalk's performance. Cardo Smartset App for Android and iOS devices enables the use of a smartphone as a remote control. It allows for operation of all main features such as A2DP, intercom, FM radio and mobile calls. The App also features multiple languages - English, French, German, Italian, Japanese, Portuguese, Russian and Spanish. Sounds really clear, calls and music. Cant even notice when you riding and talking that you are in a motorcycle. Also have a lot of commands that you don't even have to touch the device. Coming from a Sena 20S then 30K, the Packtalk Bold with JBL is better in every category. Auto connects to my whole group with the mesh, operates hands free with the voice operation and the JBL sound is unbelievably good. Cardo hit a home run with this! Can you listen to music while having an intercom conversation? Will the music cut out or do you hear voice over the music? BEST ANSWER: You can do both and the music doesn’t stop. You hear the voice over the music and the volumes are adjustable. Can you use this with any helmet? BEST ANSWER: It seems like it would be compatible with most helmets but wouldn't try putting it in anything without speaker cutouts that can be removed. Don’t know about “any” but certainly “most”. Go to Cardo website to see detail listings of helmets. Does it fit into the bell qualifier helmet, in the spot meant for the Sena SMH-10 Bluetooth Headset? BEST ANSWER: Yes. For me, I had to put the speakers low in the ear pocket . You will have to adjust and work with it a while till you get the speaker placement comfortable. My boyfriend attached his directly to iner helmet. The area the ear pockets designate, is not always best. Hope this helps. I have Bell Bullitt and the JBL speaker fit ok in my helmet after a lot of trial & repositioning. My boy friend affixed his speakers right to the inside of his helmet, in a spot comfortable for him. Has anyone used this unit with a BMW Nav 6 GPS ? Any trouble or noteable issues? How is the sound quality? For music and voice prompts for directions on the NAV? Music with the regular speakers lacks Bass response on 4/5/19 Cardo is releasing a 45mm speaker for the PT Bold I ordered it because they say this JBL speaker will be superior to all others. As far as voice no issues even with loud exhaust system as I use this on my open wheel race karts. can I still talk with people who have a sena? Anyone use this to play audio books from Audible on iPhone? What voice command do you use to open the app and play a certain book?